First and foremost, gastroschisis is a hernia. Gastroschisis is a birth defect that happens when the intestines stick of the body through one side of the umbilical cord. Due to the condition and lack of membrane around the intestines, the intestines are exposed to the amniotic fluid and unprotected during the pregnancy. Gastroschisis (Greek for belly cleft) is a defect in the anterior abdominal wall. This defect can be as large as 2-3 cm. It is more commonly located to the right side of the umbilical cord. The defect allows the small intestines to protrude outside of the body through the abdominal wall. The amount that protrudes varies in each case. In utero, the bowel that does protrude floats in the amniotic fluid, the fluid that surrounds the fetus. Interestingly, for unknown reasons, it is more commonly seen in younger mothers, particularly those who are younger than 20 years old. A link has also been noted between gastroschisis and maternal cigarette smoking and recreational drug usage. In general, there is not a clear, direct cause of gastroschisis. 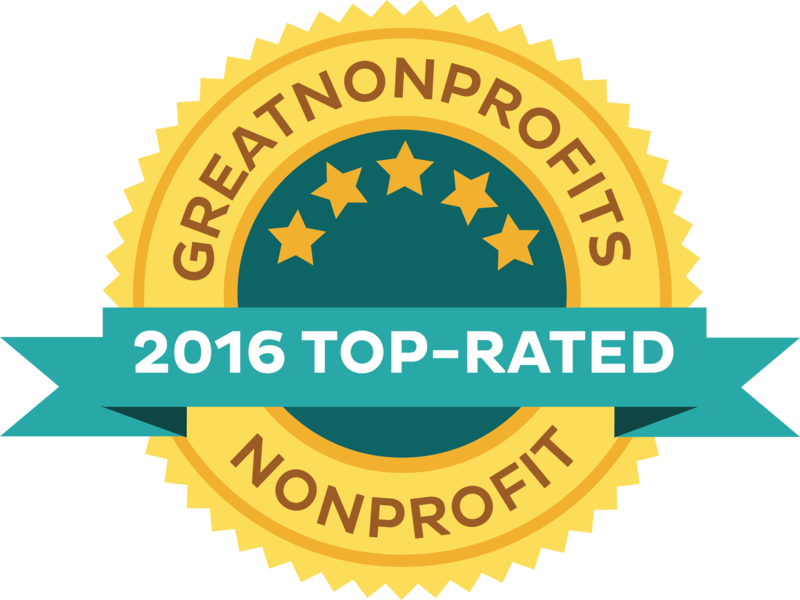 The overall survival for live born infants with gastroschisis is over 90 percent. 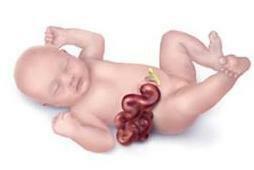 Gastroschisis occurs anywhere from approximately 1 to 5 cases per 10,000 live births. Male and female fetuses are affected equally. There are certain geographical locations that have a higher rate of gastroschisis, perhaps secondary to a higher birth rate amongst younger women and other reasons that are not clear. Gastroschisis is often detected during routine ultrasound in pregnancy. A prenatal ultrasound includes an evaluation of the abdominal wall. The stomach and loops of bowel that are still in the abdomen may appear enlarged (dilated). Loops of intestine will be seen floating in the amniotic fluid. The intestinal walls may appear bright, swollen and thickened. Sometimes, the amount of amniotic fluid surrounding the fetus is significantly reduced (the term is oligohydramnios). Alternatively, though less frequently seen, there may be an increased amount of amniotic fluid present (polyhydramnios). There may be an increased suspicion for gastroschisis based on elevated levels of alpha-fetoprotein, a marker in the maternal blood. In gastroschisis, alpha-fetoprotein levels are elevated in the amniotic fluid. This marker then crosses the placenta into the maternal blood. Elevated levels can then be detected in the mother. Also, if First Trimester screening is performed, an area in the fetus (called the nuchal translucency) may be thickened. The most common condition in the differential diagnosis is an omphalocele. One main difference between the two conditions is that a membrane covers the intestines in an omphalocele. Omphaloceles often are seen in association with other abnormalities, whereas gastroschisis is less commonly associated with multiple structural abnormalities. Omphalocele is often secondary to a chromosomal abnormality; whereas gastroschisis is not. If not diagnosed during pregnancy, gastroschisis (or omphalocele for that matter) is obvious once a baby is born. Other conditions considered to be part of the differential diagnosis are hernia of the umbilical cord and limb-body wall complex. During the pregnancy, once a diagnosis of gastroschisis is made or suspected, a fetal ultrasound will be performed approximately at 2-4 week intervals. The reason is that fetuses with gastroschisis often will not grow as well as fetuses without this malformation. The abdominal circumference will be smaller resulting from bowel being present outside of the abdomen. In the third trimester, the abdominal circumference is given greater importance in the estimated fetal weight formula. Thus, these fetuses will appear to weigh less by ultrasound than their actual weight. Sometimes, the growth abnormality is real and the fetal weight is legitimately decreased. Prolonged exposure to the toxic environment of the amniotic fluid may damage the intestines. If such changes are observed prior to 34 weeks, it may be recommended to administer a course of glucocorticoids (betamethasone or dexamethasone) to enhance maturity of the fetal lungs in the event that preterm delivery becomes necessary. These pregnancies may be associated with an increased rate of fetal demise (stillbirth) late in the third trimester. Approximately 70% of these fetuses will reach 37 weeks of gestation. If fetal growth, amniotic fluid volume, and fetal testing (BPP, NST) are reassuring, the risk of stillbirth prior to 37 weeks of gestation appears to be minimal. Therefore, delivery at less than 37 weeks to reduce this risk is not necessary. There is no clear evidence that delivery by cesarean section improves outcomes for newborns affected by gastroschisis when compared to those infants with gastroschisis born by vaginal delivery. There are currently no fetal interventions for gastroschisis. Delivery should occur at an institution capable managing a newborn with gastroschisis. At delivery, there will likely be a neonatologist present, a subspecialized pediatrician skilled at caring for newborn babies in the intensive care unit. The infant’s lower body will be placed in a special, clear plastic bag to minimize fluid loss through evaporation. The exposed bowel should be kept moist. The intestines will be supported by sterile gauze to keep the intestines from becoming kinked. The bowel will then be covered with other sterile gauze specially coated in petroleum jelly similar to Vaseline®. A tube will be placed through the baby’s nostrils then down the esophagus to the stomach. This tube will then be connected to suction to prevent bowel distention from swallowing air. Antibiotics (ampicillin and gentamicin) should be administered. IV fluid should be begun as soon as possible to replace ongoing fluid losses. It is common for these newborns to become quite dehydrated because of the excessive evaporative losses of the exposed organs. Two separate approaches have demonstrated success in managing newborns with gastroschisis. The management approaches are primary closure versus staged silo reduction, with the surgery tailored to each individual. Primary closure is when the abdominal wall defect is repaired shortly after birth. It results in a shorter time period for when the baby can be fed by mouth and, usually, a shorter hospital stay. Primary closure, however, may not be possible if a large amount of intestines and other abdominal organs are protruding through the defect. There may not be enough room to return these structures to the abdomen shortly after birth without risking significant complications. In many cases, in the delivery room or upon arrival in the NICU (the newborn intensive care unit), the bowel can be placed in a plastic silo. The silo converts the surgical closure of the abdominal wall to an elective procedure thus allowing the surgeon to wait until the bowel swelling has decreased and the intestinal loops have returned into the abdominal cavity. This process usually takes 5 to 7 days. Once the bowel has been completely reduced, closure of the abdominal wall is then performed. In addition to the obvious location of the organs outside of the body and potential damage to those organs due to exposure, infants with this condition can experience problems with feeding, digestion and absorption of nutrients. Gastroschisis has been generally considered to be a somewhat random event caused by multiple factors. Some studies estimate the recurrence risk (i.e., the chance of this condition in a future pregnancy) to be approximately 4%.